The UHV/ABR Reading Series for Spring 2019 has been announced! This season, join us again at our new time (11 am to Noon) to hear readings from Hernán Díaz, Nalo Hopkinson, DJ Spooky, Julie Iromuanya, and Joseph Tabbi. The UHV/ABR Reading Series for Fall 2018 is released! This season, join at our new time (11 am - Noon) to hear exciting presentations by Mark Amerika, Amitava Kumar, Carina Chocano, Don Lee, and Shelley Jackson. The UHV/ABR Reading Series for Spring 2018 has been announced! Join us to hear Lacy M. Johnson, Carlin Romano, Debra Di Blasi, Matt Bell, and Michael Joyce. Because of Hurricane Harvey's aftermath in Victoria and the greater Crossroads region, Lacy Johnson's Reading Series appearance on September 7, 2017 is cancelled. The UHV/ABR Reading Series for Fall 2017 has been announced. Join us to hear Lacy Johnson, Kwame Dawes, Ru Freeman, Frederick Luis Aldama, and R. Clay Reynolds. The Spring 2016 Reading Series is an exciting one! Joining us this season in Victoria, Texas will be Rikki Ducornet, Phoebe Gloeckner, Valerie Sayers, Ben Marcus, and Charles Bernstein. The Fall 2015 Reading Series has arrived! This season we will be joined by Clifford Thompson, Bill Kartalopoulos, Cyrus Cassells, Carole Maso, and David Marion Wilkinson. The Spring 2015 UHV/ABR Reading Series has been announced! Join us to hear talks by Nick Flynn, Stephen Graham Jones, Stephen Harrigan, Megan Kruse, and Alice Notley. The Fall 2014 UHV/ABR Reading Series begins this week! Come see readings by Nicolás Kanellos, Ron Riekki, Amber Dermont, Oscar Casares, and Nan Cuba. Download full citations and notes for Susan Vanderborg's review of apostrophe, part of issue 35.2's Focus on Machine Writing. ABR has lost a dear friend. Contributing Editor William Demby passed on May 23, 2013. He will be greatly missed. Our deepest condolences to his friends and family. ABR welcomes its newest Contributing Editor, Joseph D. Haske. The staff at American Book Review is greatly saddened to report the loss of Jake Adam York, who passed on December 16, 2012. He led a great reading and discussion at UHV just a few weeks ago as the closing speaker in our Fall 2012 series. Jake was a great poet and a good friend. He will be missed. For his friends and fans, here is the video of his final reading. The Spring 2013 UHV/ABR Reading Series has been announced!. Come see readings by Naomi Shihab Nye, Manuel Martinez, Jess Walter, Cristina García, and Tim Z. Hernandez! Our Fall 2012 Reading Series has just been announced! Featuring Steve Tomasula, Paisley Rekdal, Mathew Johnson, Norma Cantú, and Jake Adam York. This year marks our 50th speaker in the UHV/ABR Reading Series with Robert Coover. ABR welcomes Jeffrey A. Sartain as its new Managing Editor. The Colin McEnroe Show on WNPR, Connecticut Public Radio, has broadcast a show on "The Era of Bad Books." 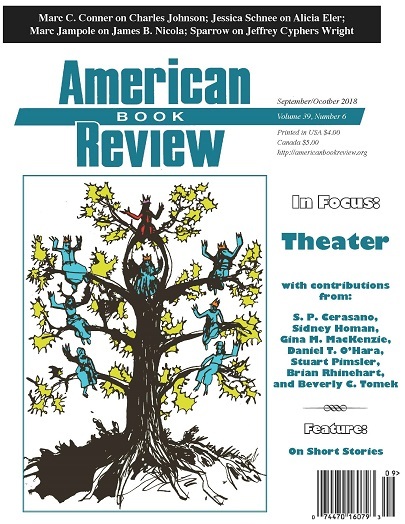 Davis Schneiderman contributor to ABR's issue Top 40 Bad Books, is a guest on the program. Listen to the program here. ABR welcomes its newest associate editors to its editorial board: Dagoberto Gilb and Charles Johnson. Our issue on Top 40 Bad Books (31.2) is creating some interesting discussion in the Guardian(UK), The New Yorker, LA Times, and Huffington Post. Did you know that ABR has free videos available on its website of presentations by past reading series speakers with video of such literary treasures as Angela Ball, Andrei Codrescu, Mark Doty, Raymond Federman, Dagoberto Gilb, Charles Johnson, Antonya Nelson, Marjorie Perloff, and many more, this selection can be browsed and viewed here. ABR welcomes its newest associate editors to its editorial board: Dinda L. Gorlée, Cris Mazza, and Christina Milletti. We at ABR are mourning the loss of Raymond Federman, longtime editor of ABR, preeminent innovative writer, critic, and translator. Federman changed tense October 6, 2009 after a long battle with cancer. His voice will go on in our memories. Check out The Buffalo News's comments on our Fiction's Future issue (30.5). The Buffalo News released an article on June 12, 2009 discussing the synchronicity of ABR and The New Yorker having similar focuses on the teaching of creative writing around the same day. Inside Higher Ed released an article about the American Book Review; Jeffrey R. Di Leo, ABR editor and publisher; and the University of Houston-Victoria, ABR's host institution. Click here to read the article.